MacManus started work at Fleetway Publications in 1973, as a sub-editor on Valiant, which was part of the Juvenile Group of comics and magazines aimed at young people. He was part of a team of four people: an editor and a sub-editor, an art editor and an art assistant (often referred to as a bodger). He subsequently worked on Battle Picture Weekly, and although he wasn’t part of the core team working on Action he got involved in some elements of that title too. Starlord was his next step and when that merged with 2000AD he went to that title, eventually becoming Editor in 1979. In 1986 he moved sideways and relinquished the editorship to stay involved with the Judge Dredd universe, with the creation of titles for a more mature audience – Crisis (in 1988), the short-lived but beautiful Revolver, and the much longer-lasting Judge Dredd the Megazine. The book ends in 1991 with the collapse of the Maxwell Communication Corporation (which had bought IPC’s remaining comics line in 1987) and the subsequent sale of the titles to Gutenbergus (later Egmont), though the last chapter of the book, effectively an epilogue, races through the aftermath of the subsequent years through to 2011. 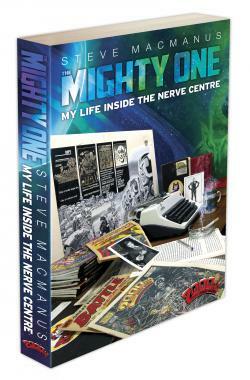 During this book he talks about working with key staff contacts such as art editor Doug Church, editor Dave Hunt, art editor Jan Shepheard; and with well-known freelancers like Pat Mills, Alan Grant, John Wagner, Tom Tully. The names we are familiar with from girls comics publishing – Mavis Miller, Wilf Prigmore, Terence Magee – mostly don’t get a look-in but there are certainly some folks mentioned who crossed over that significant divide as we will see – Gerry Finley-Day, Jim Baikie, and of course Pat Mills again (who seems to get everywhere). If you want to read anecdotes of those days, or find out how a boys’ comic of the time was conceived, written, drawn, put together, printed, and marketed then you couldn’t ask for a better book than this, and a fun read to boot. I’m sure it will get people digging out their old issues of the comics mentioned, or looking out for reprints of stories they missed (it’s certainly had that effect on me!). 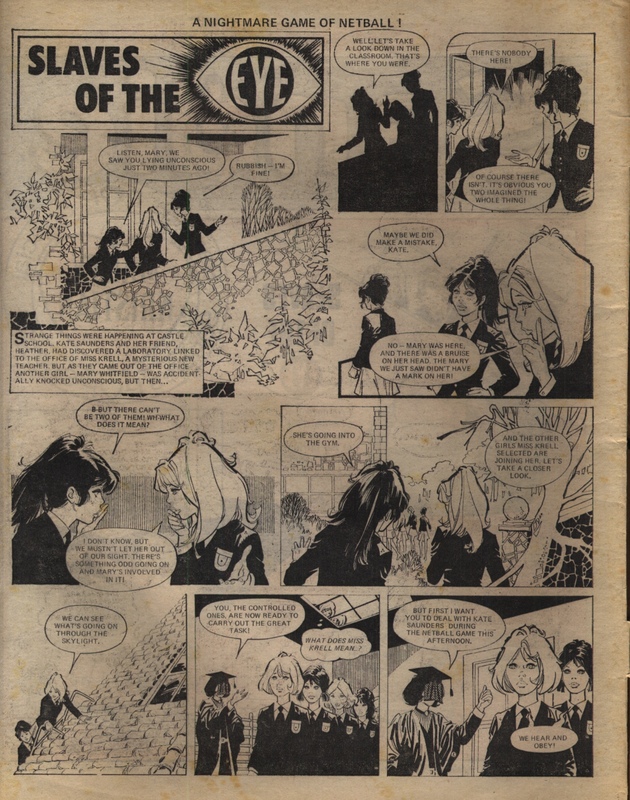 My interest in getting the book in the first place, however, was to see what light it might shed on the creation and publishing of Fleetway / IPC’s girls comics. It did not disappoint. As mentioned above, some of the information in the book is material that we already know or had a good idea was the case, but it’s good to have it corroborated in a printed source that can be referenced in the future. Some of the information, however, is stuff I’d never dreamed of, and which has got me thinking of new things to look at and analyse in Jinty and other comics. What did we already know that is corroborated here? There are some basic facts that are repeated here about things like the target age of the readership (8-12 years), and the sales figures of the time (around 80,000 copies per week normally, with 2000AD achieving noticeably strong sales of 100,000 copies per week, but still being out-sold by Tammy which was selling 200,000 copies a week). 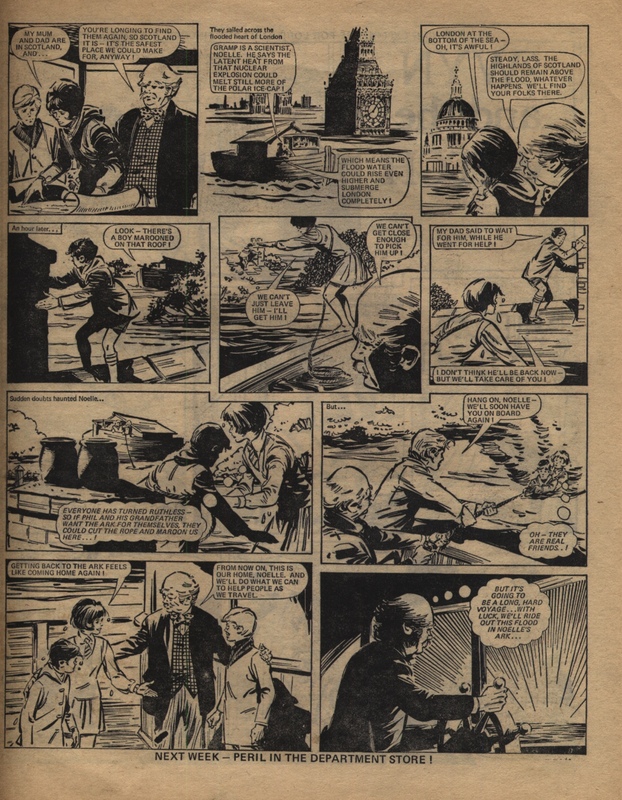 The expectation was that any given child would be reading the comic for a maximum of four years before going on to other things (it states in the book that a boy might give up his weekly comic in order to save up for something bigger and more grown up). So the rule of thumb, as we’ve heard before from Mistyfan, was that stories from a specific title could be reprinted in that title after some 5 years had passed. The normal format of a comic was 32 pages, which included 3 pages of editorial material or features (intro page, letters page, back cover) and the front cover – so 28 pages of comics, normally divided up into 8 stories of three or four pages each. The book doesn’t say specifically, but presumably as with Jinty there would normally be a couple of single-page strips to make up the 28 pages of comics. It was pretty clear beforehand that comics at the time were fairly blokey. Of course MacManus was talking about working on boys comics, but almost all the names he mentions were of men, apart from Jan Shepheard. The office staff, the colleagues he socialised with, the management – just about everyone he mentions was male. The magazine publishing side was more mixed, with columnists such as Julie Burchill coming in for a mention alongside female editorial staff on titles. The Juvenile Group had separate departments for boys’ comics, girls’ comics, nursery comics, and humour comics. It’s clear from this book that these departments were a lot more separate from each other in terms of culture and networking than we might have imagined. The girls comics and the boys comics were very much separated from each other – they were located on separate floors, for instance – and there is little evidence in MacManus’ book of much fraternization between the two. (Gerry Finley-Day was one of the exceptions – he was the deputy managing editor of the girls’ comics line at the same time as he was writing stories for the initial line up of Battle.) So much so that when talking about Jim Baikie coming aboard to 2000AD wagon (for “Skizz” in 1982), MacManus was seemingly totally unaware of Baikie’s background in drawing girls comics, knowing him only as a Look-In artist! I asked MacManus via Facebook whether he really had been entirely unaware of the crossing-over from girls comics to boys comics that Baikie, Ron Smith, and Phil Gascoine had done, and he confirmed that he didn’t think he knew it then and was surprised to hear it now. At the same time, there must have been some awareness of what was happening in the other area, as MacManus appreciated the notable successes that were happening with Tammy and Jinty. 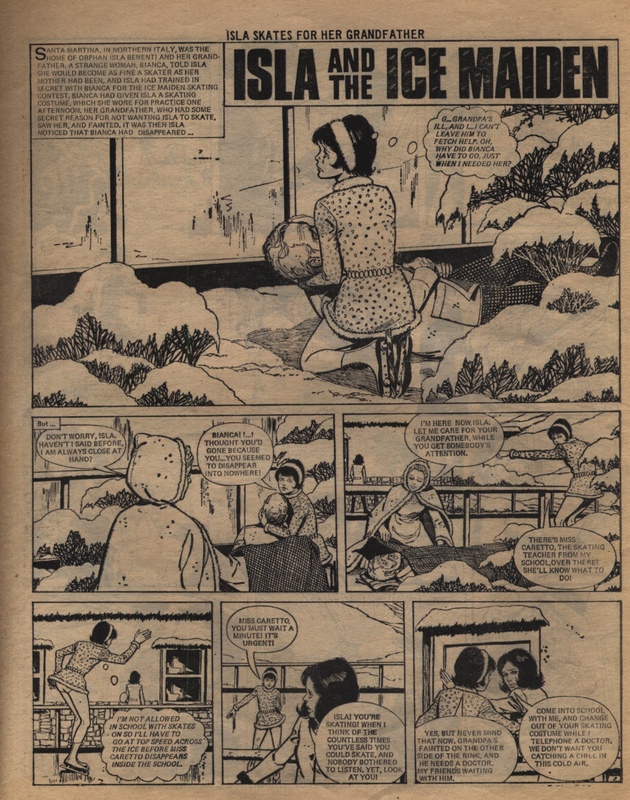 The running order of the stories in each 32 page issue was closely tied to the popularity of the stories in question. In Valiant, the most popular story appeared at the front of the comic, and the second most popular one at the back, which makes sense. But MacManus also says that the least-liked heroes would be marked for the chop in ‘an end-of-term edition in which all the current serials concluded’, which surprised me! I don’t remember noticing that lots of stories normally came to an end at the same time, in Jinty at least – but I will certainly look at the story list by date to see if there are patterns for when stories tend to end or start. Not really known beforehand but not surprising as such: MacManus gives us a little bit of detail about the taglines at the top of each cover – ‘the pithy phrases known as toplines’. These were apparently produced ahead of time – ‘several of these to last us the next few issues’. I knew that there was quite a lot of active creative work required of those working as in-house staff at IPC (no doubt the same was true of DC Thomson too): we hear of Gerry Finley-Day writing umpteen stories at the same time as being a staffer, and we know about the script conferences held in the editorial offices of the comics. I was surprised, though, to understand quite how hands-on those creative processes were at all levels of the publishing process. MacManus was required to do quite a lot of writing as a normal part of his job, and he talks about the specific encouragement to write scripts and features. Art duties likewise were an important part of the in-house staff work: the bodger or art assistant would redraw elements that had been perhaps misunderstood by the main artist, or which needed amending for other reasons (such as to tone down a shocking scene, or to touch up old artwork that was to be reprinted in a different format). The art editor was responsible for the overall look and feel of the comic; we’ve heard elsewhere about how much of an effect Jan Shepheard had on early 2000AD for instance. A high level of creative endeavour was expected and required: MacManus’ interview with IPC turned at least partly on his ability to spell, and everyone on staff knew that there were a lot of parental and media eyes focused on the comics, ready to spot any errors or grammatical flaws. But at a basic level of comics publishing, too, the editorial role included the creative element of subbing the dialogue written by the author so that it fitted into the space left by the artist, while continuing to respect ‘the dramatic “beat” of the pictures so that the story flowed seamlessly for the reader’. We’ve heard before from Pat Mills that women were generally uninterested in working on the comics because they wanted to work on the women’s titles, as proper journalists. I’m sure that was a real thing, but what Pat’s narrative doesn’t include is the fact that other people working on the comics also wanted to be ‘proper journalists’ too – MacManus recounts the attraction of the idea of working on a magazine and holding your head up in the queue for the staff lunch! It was also an area of the business with a lot more budget to play around with. Between this relatively greater respect accorded to journalists working on consumer magazines, and the blokey background of many parts of the publishing company, it’s perhaps not that surprising that many women may have been a bit uninterested in working on the comics. 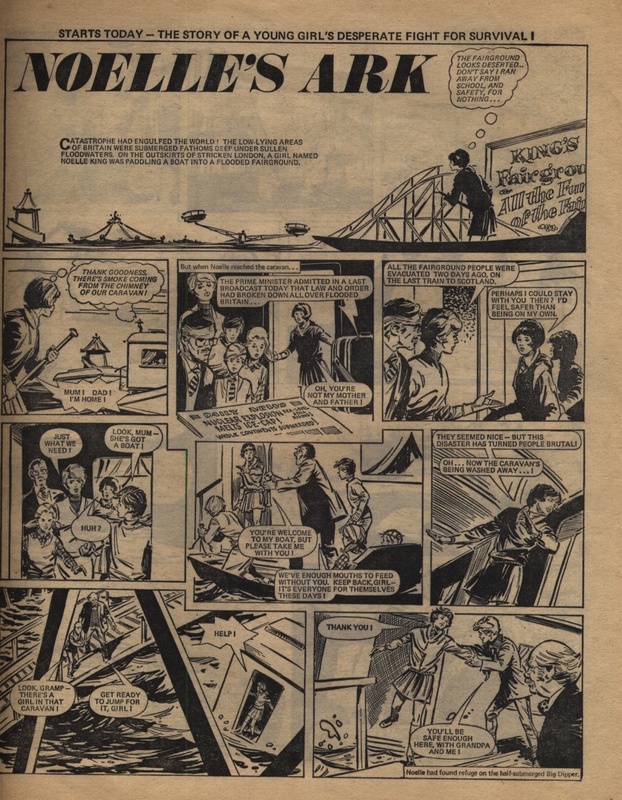 It’s clear from MacManus that Scottish rival DC Thomson were immensely important not only in providing a competitor to race against, but also in the transfer of knowledge and methods to the better-paying London publisher. MacManus attended an in-house training course on scripting picture strips for girls, run by John Purdie, the managing editor of the girls’ department and an import from DCT. Writers Pat Mills and John Wagner, were similarly trained in the DCT writing style – but with particular expertise in writing girls comics, which was described by Pat Mills as being particularly plot-driven, with four sizeable things happening in the space of a single 22-panel episode. This brought in a professionalism and strength into IPC’s boys’ comics writing by explicitly teaching staffers how to write and edit tightly. MacManus contrasts this with the common technique of starting an episode with last week’s cliffhanger, resolving it, doling out a smidgen of plot development, before ending on another, often spurious, cliffhanger. MacManus talks about the dummy issue of Battle being produced six weeks ahead of the first issue going on sale, and this six-week lead time crops up at other points in this book. (Amongst other things it means that ‘For a new weekly title the soonest you could end a strip was around issue twelve’.) Of course there would have to be some sort of publication lead time but it’s nice to have it nailed down fairly specifically. I’d like to have heard exactly how far in advance the advance copies were printed – we’ve heard elsewhere that there are around 30 ultra-rare copies of the issue of Action printed just before the order came to stop the presses and re-jig the level of violence in the title. Does that mean that an advance copy of Tammy‘s last issue, with the final episode of “Cora Can’t Lose”, might have been produced or even printed? You’d think someone would have mentioned it by now, but who knows… Or if not a printed copy of the issue, could there be any remaining scrap of the ‘make-up book,which listed the status of scripts and artwork for each issue going forward’? MacManus says right at the beginning that when he joined Valiant in 1973 he was surprised to see the same characters he’d followed a decade earlier, when he read it as a boy. Captain Hurricane, The Wild Wonders, The House of Dolmann, Raven on the Wing, Kelly’s Eye, Jason Hyde, The Steel Claw: that’s a lot of ongoing characters! I don’t know Valiant enough to have a feel for how many of those were really long-running but clearly a number of them were – many more than was the case in Jinty or even Tammy. Jinty only had one or at maximum two ongoing characters at a time, while Tammy had the long-running Bella and Molly Mills of course. But neither girls’ title was chock-full of long-running stories in the way that MacManus sees as the norm in boys’ comics. MacManus talks a few times about stories being measured in terms of the number of panels in the story. At one point he refers to a ‘twenty-two picture episode’ and at other points to a ‘thirty-picture script’. There are two things that surprise me about this. One is the terminology, using ‘pictures’ or ‘frames’ instead of panels (likewise he uses ‘speech bubbles’ instead of ‘word balloons’). it’s subtly different from the terminology I’m used to – I suppose my vocabulary for this has been influenced by US comics, and I’d never noticed the small differences. It makes sense of the many references to ‘picture-stories’ instead of ‘comics’ though, I guess. But the thing that surprises me most about this is the idea of measuring stories in pictures or frames, rather than in what I would never have questioned as the key unit of a story – the page. Of course, the page has to still be considered a very important unit – you have to fill up 32 pages in each issue, and the physical page is what the reader turns over to see something surprising that has been hidden from them until that page turn. The real lightbulb moment associated with this, for me, was when MacManus explained the thinking behind running only five stories in the early 2000AD – he credits Pat Mills with the notion of leaving out the most-unpopular two or three stories out of eight, and going straight to only printing five stories in each issue, with more pages allocated. MacManus specifically says ‘Each story still had the usual number of pictures, but the extra pages allowed the pictures to be drawn larger’. Wow! Yes, this is clearly what is happening, not only in 2000AD but also to a certain extent in Misty. Available from Rebellion £9.99 for the print edition (ISBN 978-1-78108-475-5). 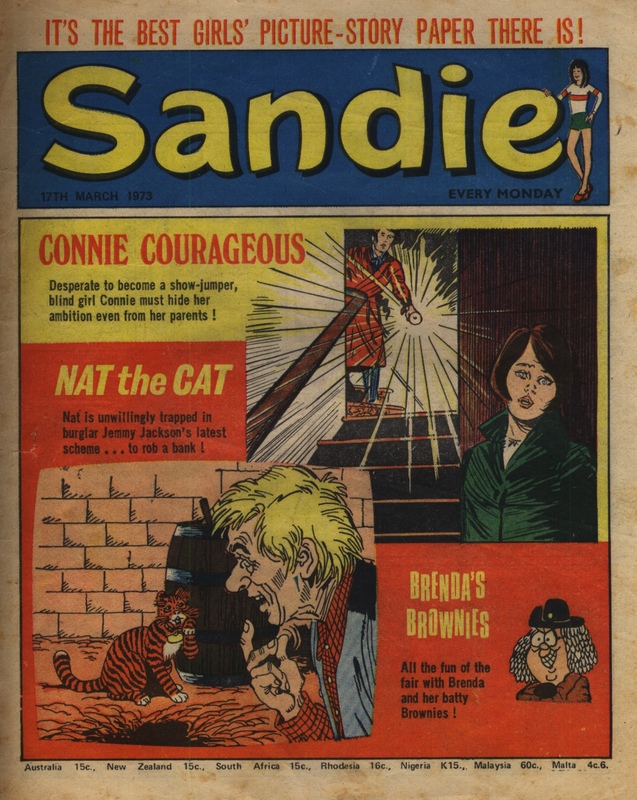 Sandie ran from 12th February 1972 to 10th October 1973 and was edited by John Wagner. She then merged with Tammy, bringing “Jeannie and Her Uncle Meanie” and, more importantly, “Wee Sue”, who would last in Tammy until 1982. 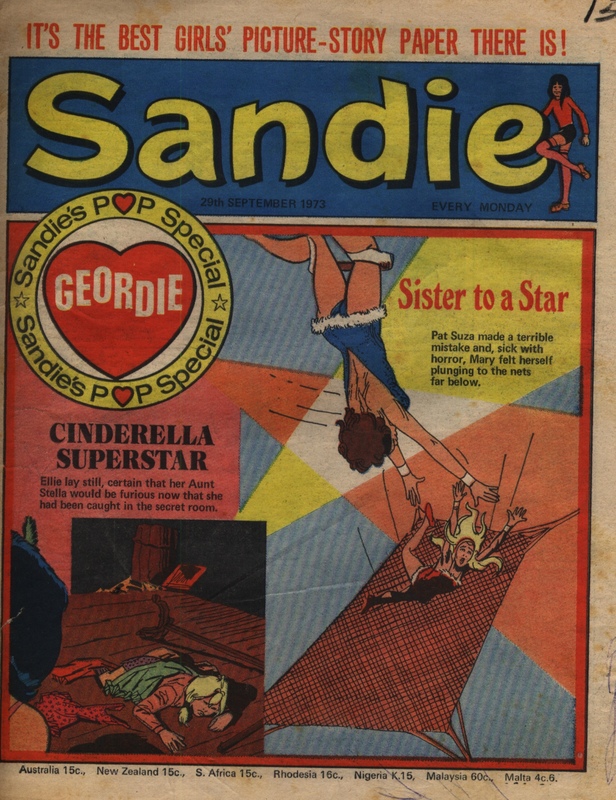 I do not have the first issue of Sandie, so the seventh is presented to represent some Sandie context in Jinty’s family tree. 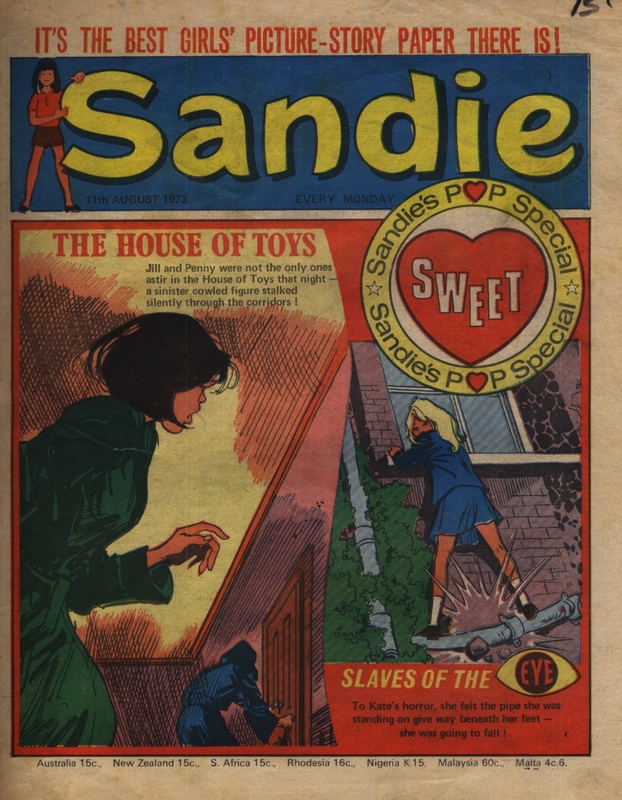 The content of Sandie feels closer to that of the early Jinty than the early Tammy, which was more into dark tales of cruelty, abuse, exploitation and slavery. 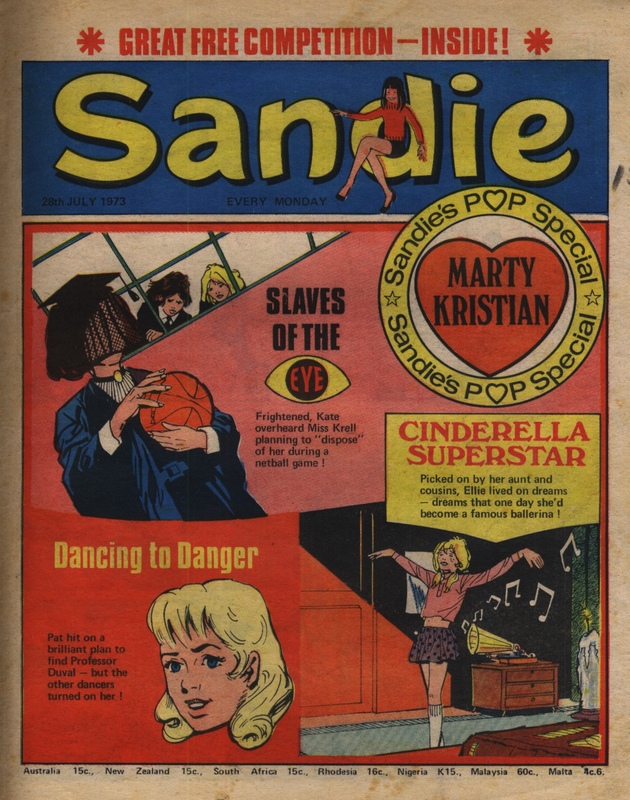 Sandie did have her share of such tales, but there was more of a blend with other types of serials. She did not have the heavy emphasis on science fiction and fantasy that Sally had either. Tammy readers would be surprised to see how Wee Sue looked when she first began in Sandie, for her strip bears little resemblance to its premise in Tammy. Here it was not played for light relief and did not use a “story of the week” format where Sue’s famous big brains would come up with ways to get out of various scrapes, being the bane of the bullying Miss Bigger, or sort out someone’s problem. She does not attend Milltown Comprehensive and there is no Miss Bigger at all. Instead, her strip looks more like a serial, and she is a scholarship girl at exclusive Backhurst Academy, which has emphasis on sport. But it is facing closure, so Sue is trying to come up with a way to save it. “No-one Cheers for Norah” has such a similar premise to Jinty’s “Toni on Trial” that there has been speculation that it was the same writer. Similar to Toni, Norah Day’s father was accused of theft at a sports event years ago; the scandal just refuses to go away and the stigma is now threatening Norah’s own career in the same sport. And both girls have to contend with a scheming, jealous rival as well. But Norah’s story has a tighter plotting than Toni’s; it is resolved in 12 episodes as compared to Toni’s 21, and the resolution is far more action-packed. 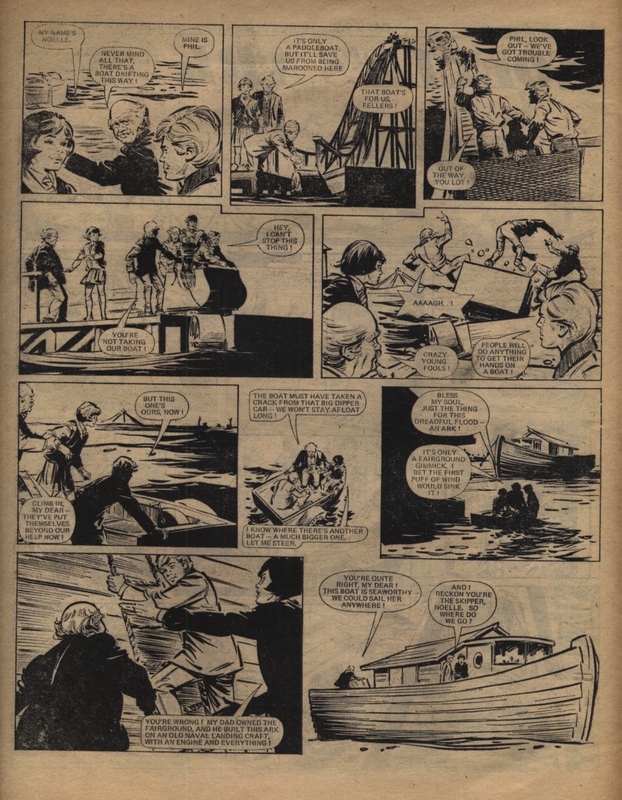 It may also be the same writer as Jinty’s “Tricia’s Tragedy” as both serials climax with a do-or-die swimming race against a spiteful cousin, who gets roundly booed off for her conduct afterwards. In “Odd Mann Out”, Susie Mann leads the resistance against the tyrannical administration at her school. The tyranny is not as over the top as in some stories with a dictatorial school (say “The Four Friends at Spartan School” from Tammy), which is quite refreshing. “The School of No Escape” has a school falling under a more mysterious form of oppressive administration – pupils mysteriously disappearing and then turning up in hooded robes and looking like they’ve been brainwashed or hypnotised. “Anna’s Forbidden Friend” is a poor girl befriends rich girl story. But the threat is not so much from the rich father but his manager, who is conducting unscrupulous evictions. In “Our Big Secret”, the threat to a friendship comes from a Mum who won’t allow dogs, so Poppy Mason has to keep her new dog Pedro secret. This leads to hijinks, such as Pedro unwittingly starting a ghost hunt in this issue. Aristocracy also features in a few strips. In “Not So Lady-like Lucy” it’s hijinks My Fair Lady style. In “Little Lady Nobody” it’s an evil squire out to cheat his niece out of her inheritance and even – shades of “Slaves of ‘War Orphan Farm’” – make her work in a quarry! It’s even the same artist. Is that coincidence or what? And in “Bonnie’s Butler”, life gets more interesting for Bonnie Belthorp when she inherits a butler called Greston. There just has to be a ballet story, and in this case it is “Sandra Must Dance”. Sandra can only dance through a psychic bond with her twin sister. Not the best way to be assured of a secure career, as the twins begin to discover in this episode. And now a jealous rival has worked out the secret too. Eduardo Feito was a popular choice for drawing horse stories, especially ones that feature show jumping. “Silver is a Star” here is no exception. And of course there are regular cartoon strips. In the case of Sandie it’s “Brenda’s Brownies” and “Wendy the Witch”.